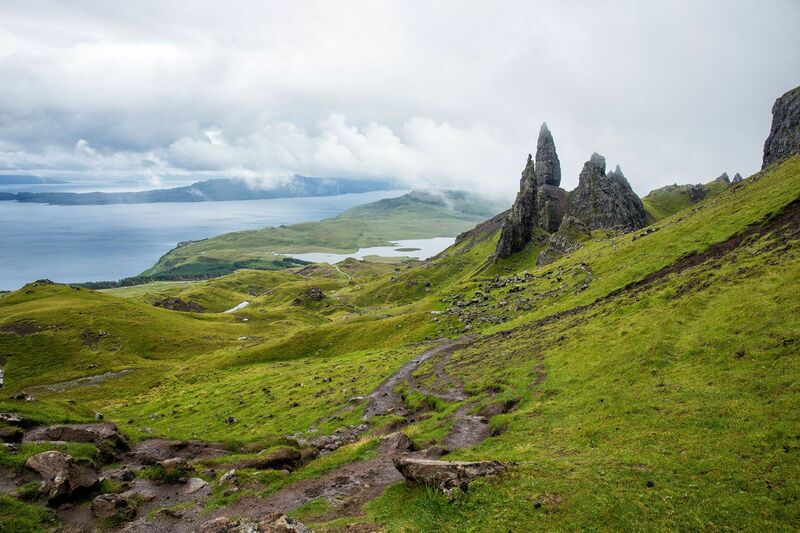 If there was one thing we wanted to see on the Isle of Skye, it was the Old Man of Storr. 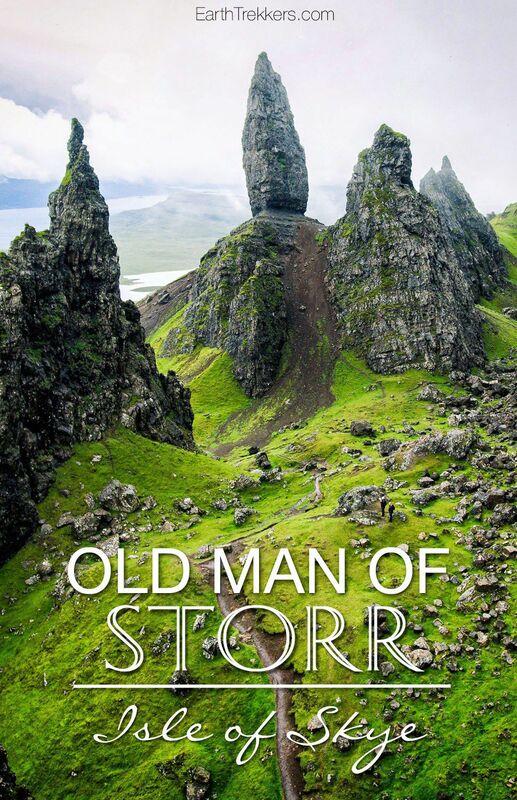 The Old Man of Storr is iconic Scotland: spiky pinnacles of rock set against the backdrop of rolling green hills and the coastline of the Isle of Skye. 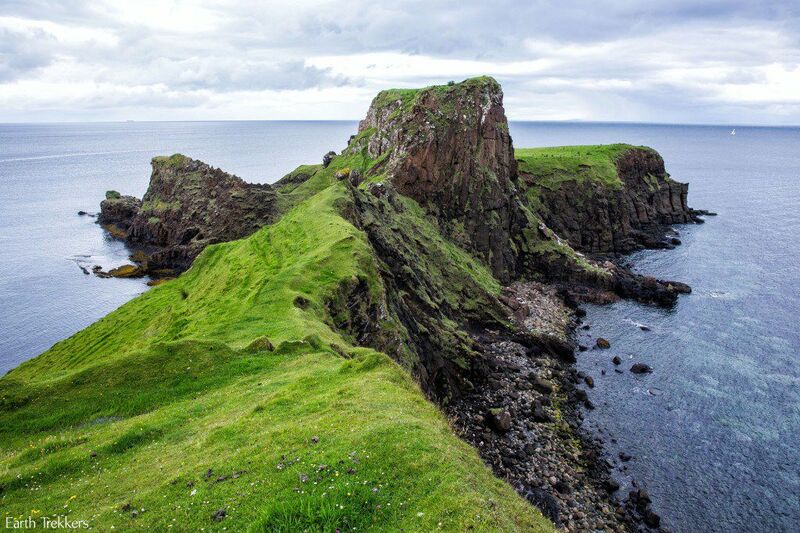 This image is featured in Scotland guidebooks, blog posts, and travel posters. It’s beautiful and we just had to see it. 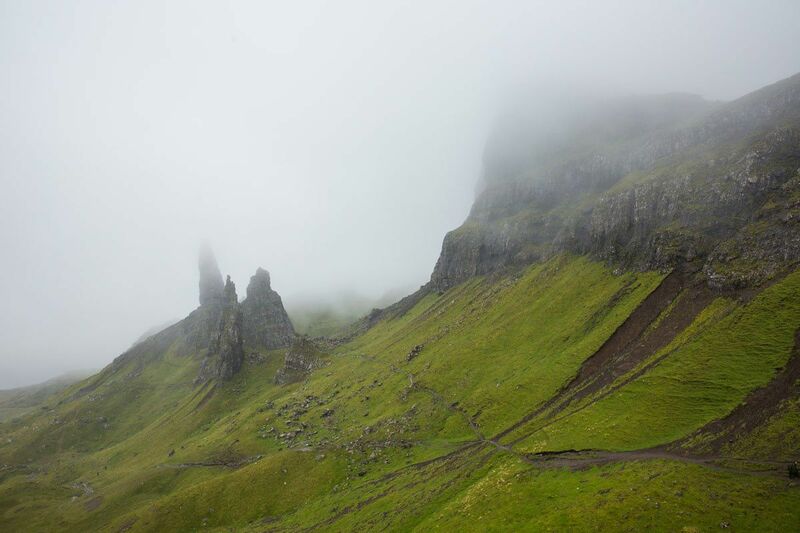 We toured the Isle of Skye at the end of July, peak tourist season. During this time, crowds and rainy weather are in abundance. 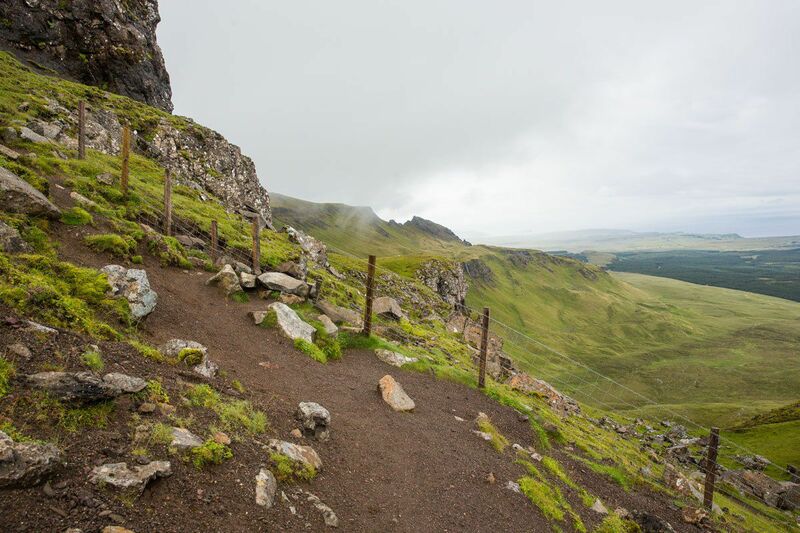 Cars lined the highway, overflowing from the designated car park at the trailhead to the Old Man of Storr. 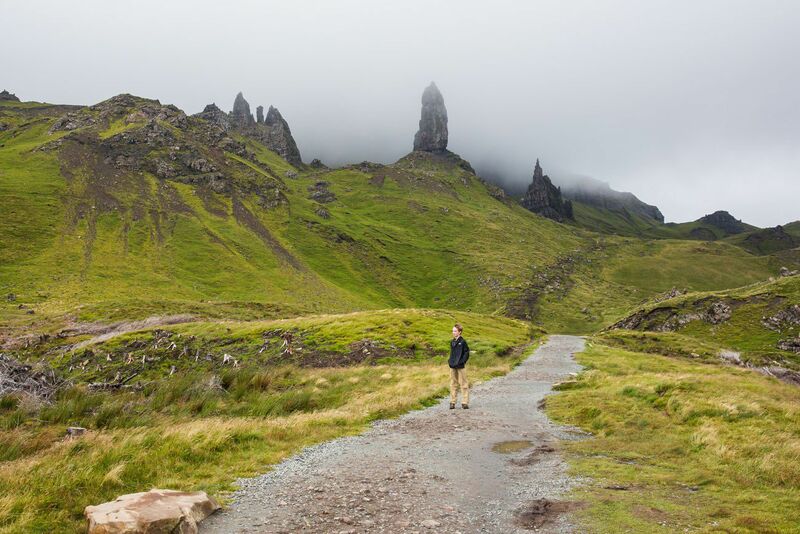 As we hiked uphill towards the Old Man of Storr, clouds loomed overhead. 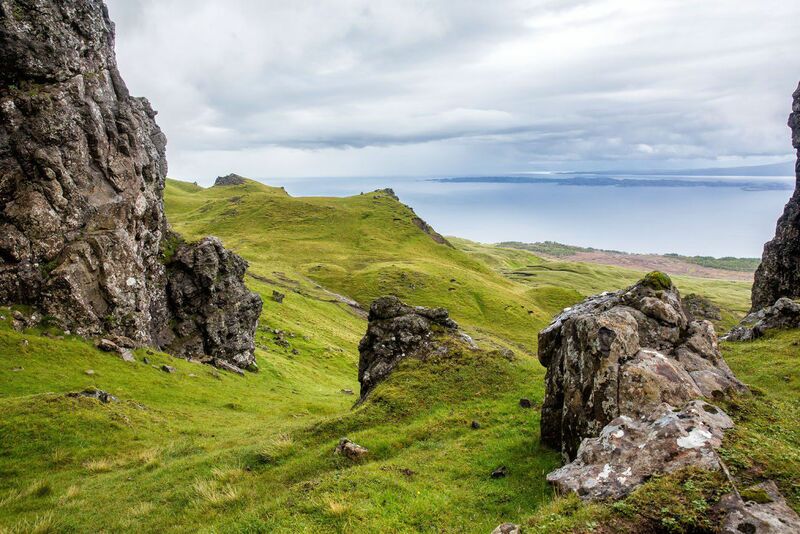 Even so, the views across the Isle of Skye were awesome. Halfway up, the trail becomes a dirt trail. After it rains, the trail is very muddy and the rocks on the trail are slippery. It is not a difficult hike, but it is a slow and steady slog to the top. 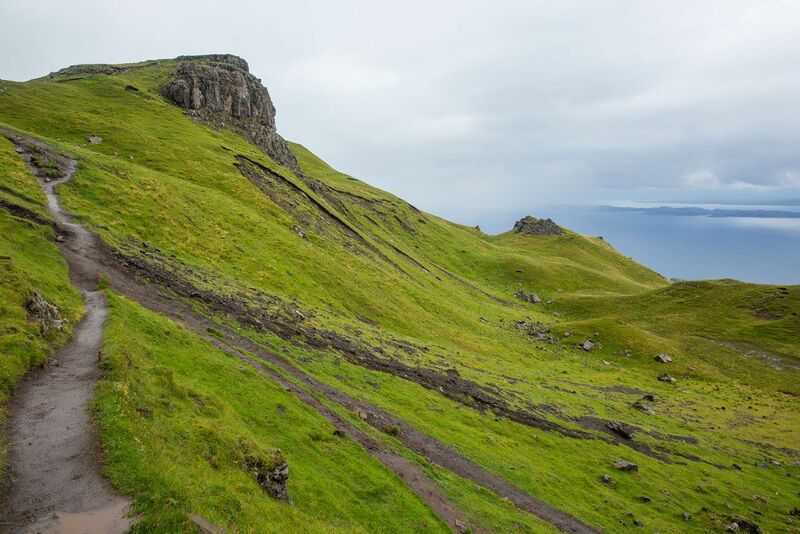 For the best view of the Old Man of Storr, continue to follow the trail along the ridge to the right. This slowly leads up to another prominence, and from here, you will get to see that iconic view. That is, if it isn’t raining. By the time we got up here, those looming rain clouds were dumping huge amounts of rain on us. It was also very windy. In a matter of minutes, all four of us were soaked. That view I wanted to see was almost completely hidden in the rainclouds. It was so disappointing. Most people returned to their cars, washed away by the rain. But not us! A wee bit of rain cannot deter us! Tim convinced us to wait around to see if the showers passed. 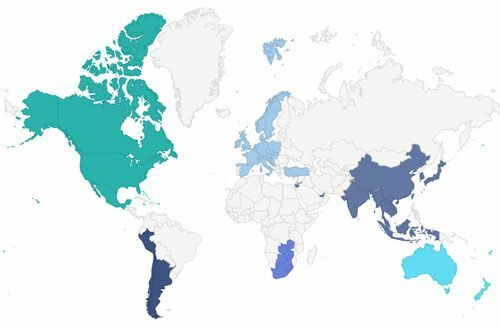 That seems to be the trend in Scotland. But could we be patient enough? 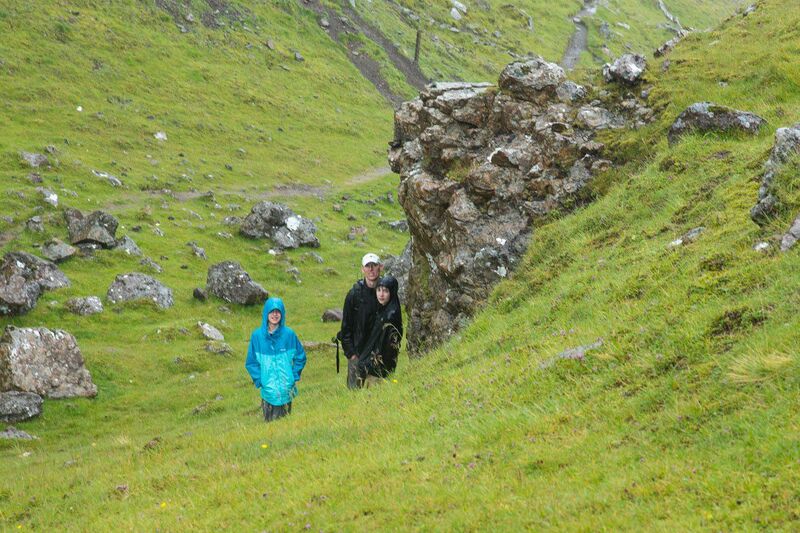 Tim, Tyler, and Kara waited out the rain under a large rock. It was the best shelter they could find in the area. After waiting for over ten minutes, the rain stopped and the skies brightened. Tim was right! And now I could finally get those photos I wanted! Tyler flew the drone while I took my photos. 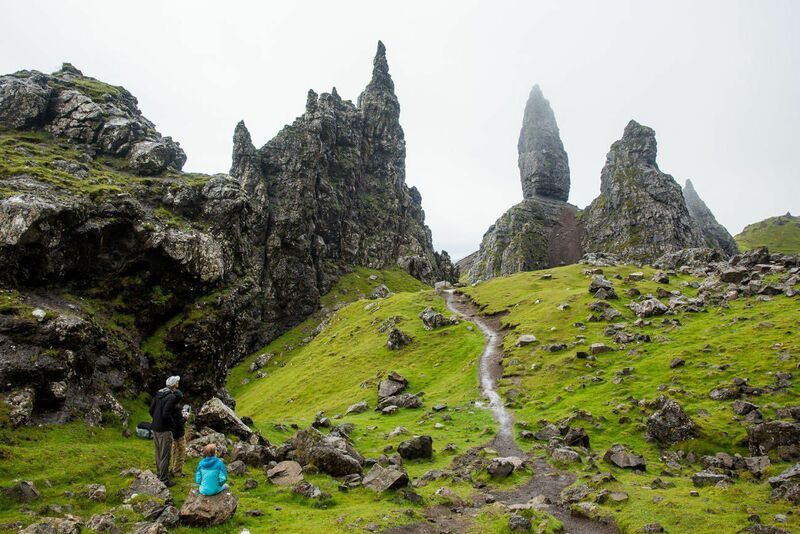 The big advantage of the rain is that we now had the Old Man of Storr all to ourselves. It was incredible!! Eager to go exploring, I climbed over the barbed wire fence at the end of the trail (since our visit, a stile has been added to the fence to make it easier to continue on the trail). I just had to see what was on the other side. This island is beautiful! Our break in the rain did not last long. By the time I rejoined Tim, Tyler, and Kara, they had just finished up another epic drone flight. 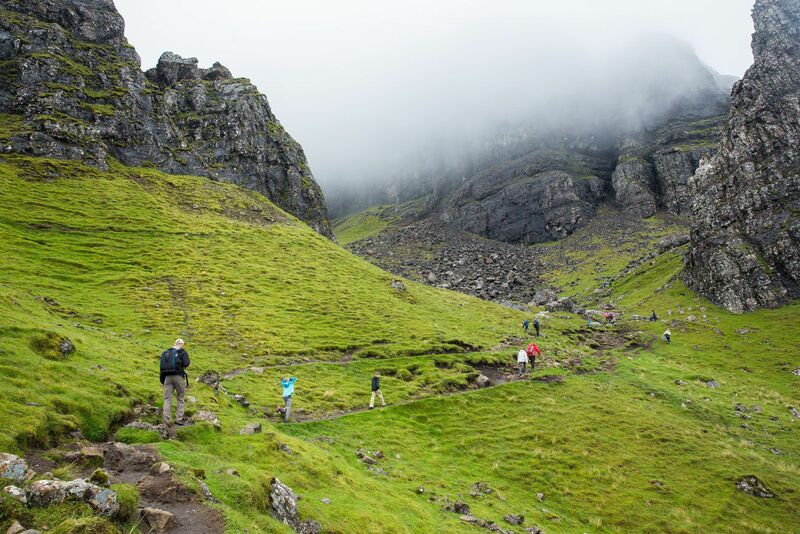 More misty clouds were creeping in and the next swarm of hikers were climbing up the hillside. Our timing could not have been better! 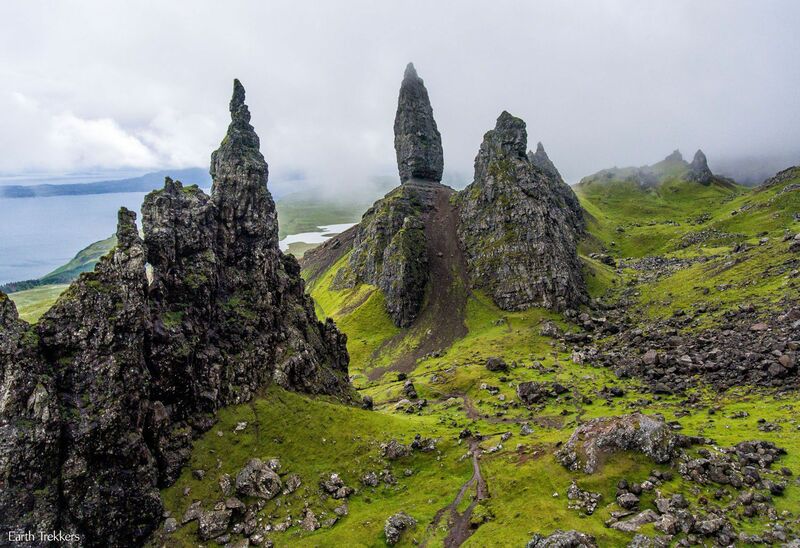 The Old Man of Storr is the Isle of Skye’s most popular and most photographed location. 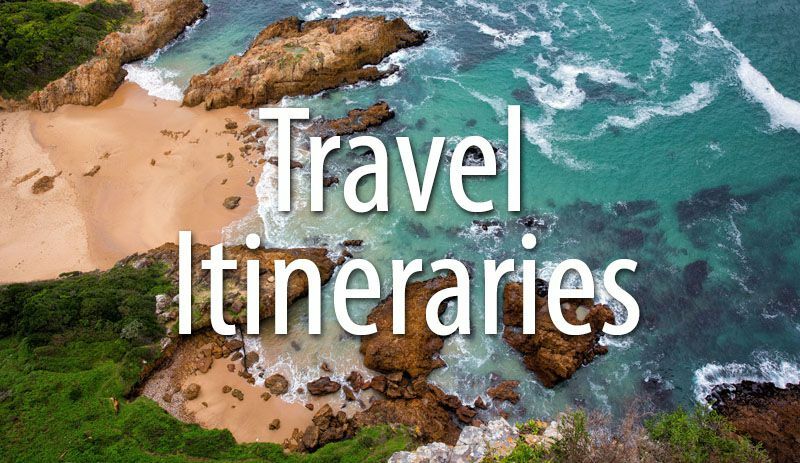 Expect it to be very busy. The best times to visit are early in the morning and later in the day. It is the most crowded between 10 am and 3 pm. 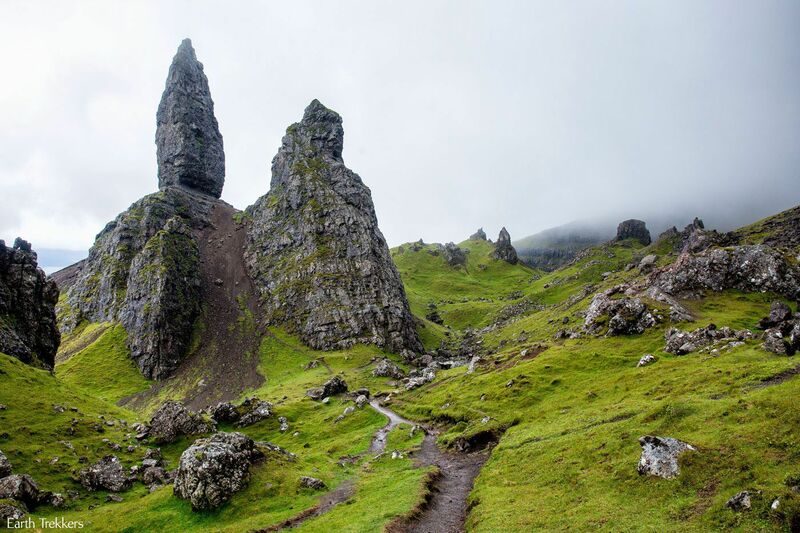 The Old Man of Storr is located on the Trotternish Loop, 7 miles north of Portree. There is a large car park on A855. During the busy summer months, the car park may be full, making visitors park on the shoulder of the road. Allow 1.5 – 2 hours for your visit. This is plenty of time to make the walk up, take your photos, enjoy the amazing view over the Sound of Raasay, and get back to your car. 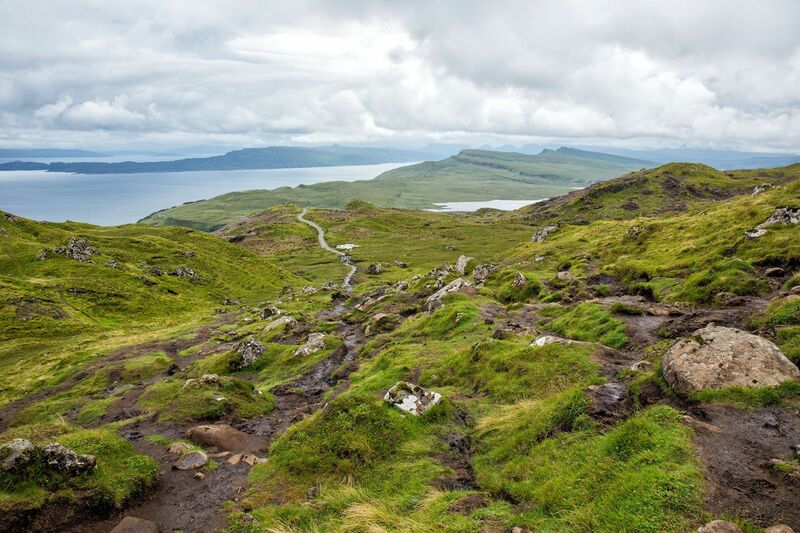 It is a slightly strenuous climb up to the Old Man of Storr, but anyone of average fitness should do OK. 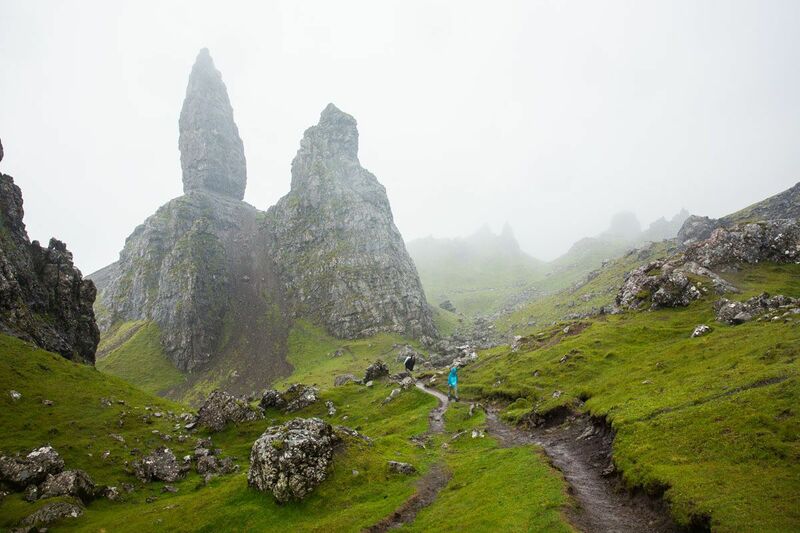 There is a hiking loop through the more scenic portions of the Old Man of Storr. We were unable to do this because of the rain. For more information, visit the Walk Highlands website. 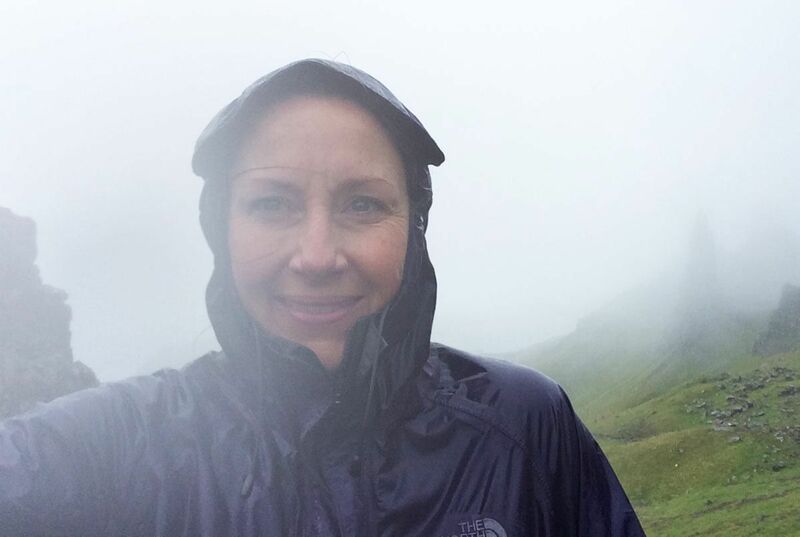 If it has been raining, hiking shoes are advisable. The trails will be muddy and slippery, so a good pair of walking shoes is a must! 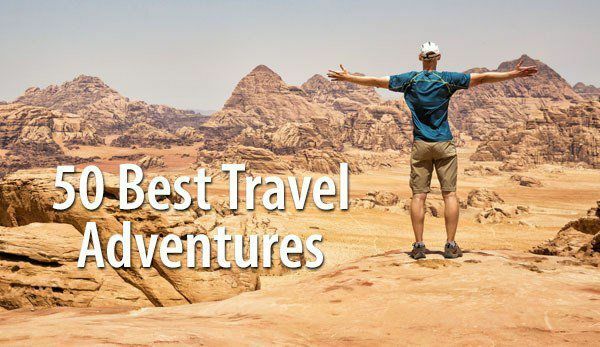 Water resistant hiking shoes are ideal. If it is raining, have patience. 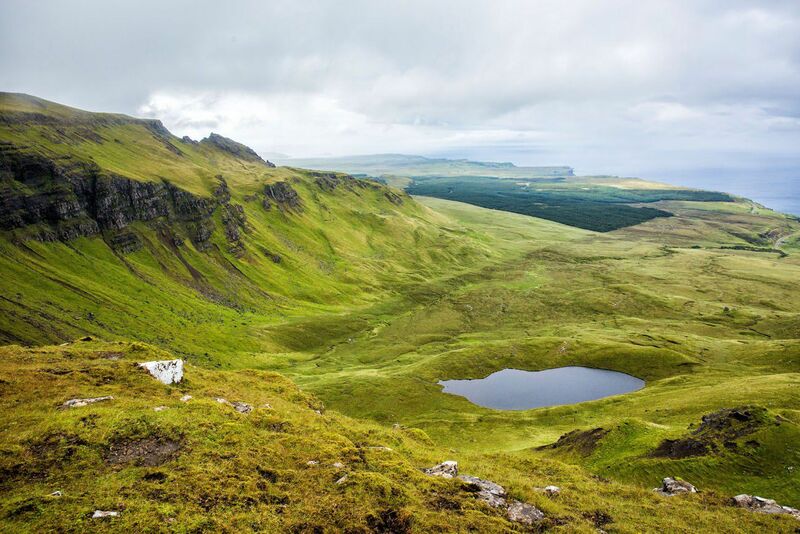 Rains typically do not last long in Scotland. 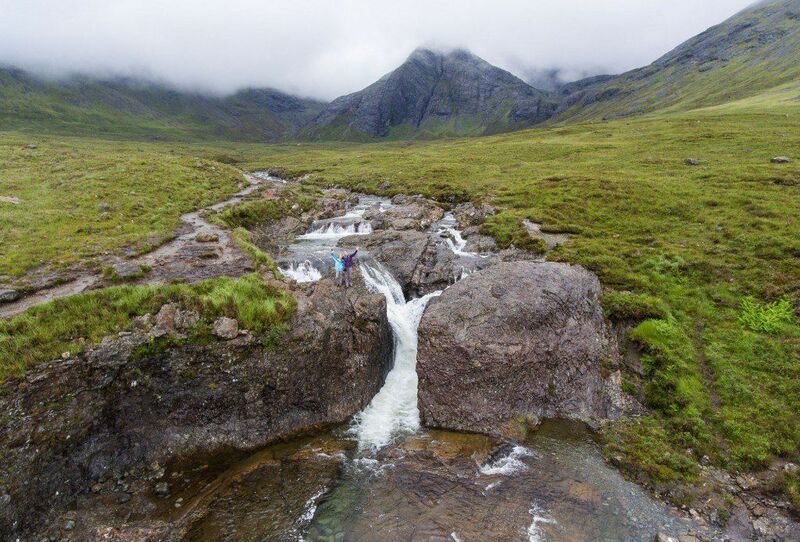 We sat out quite a few rain storms on our visit to the Isle of Skye. Make sure you have a good rain jacket and umbrella. Most visitors flee back to their cars during the rain, leaving you on your own. There’s a silver lining to every cloud, right? 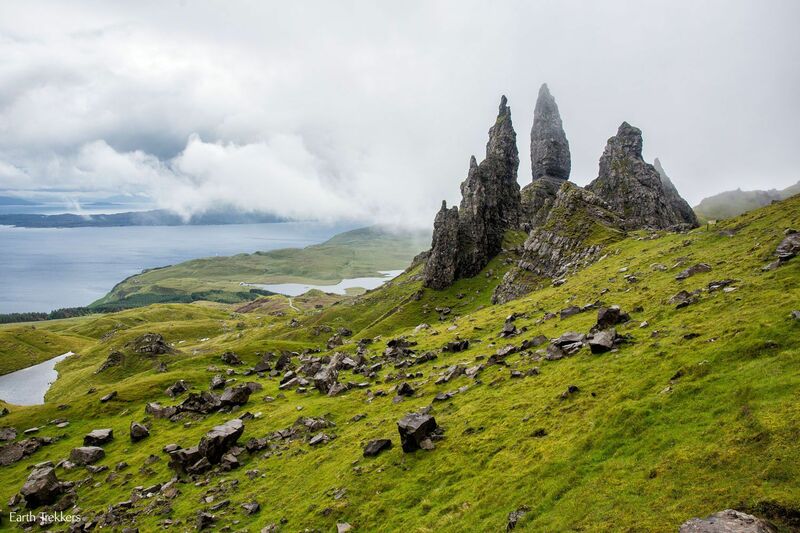 About our Visit: We visited the Isle of Skye and Scotland in July 2016. Thank you for all your Scotland posts! 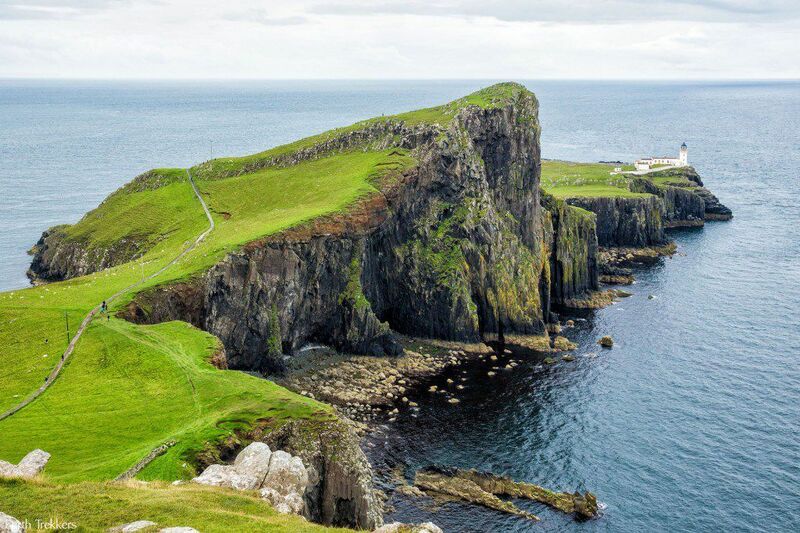 I’m visiting Scotland for the first time this coming June, and all your posts, pictures, and videos have made me even more excited for my trip. All your posts are very informative, especially with estimated hiking times. 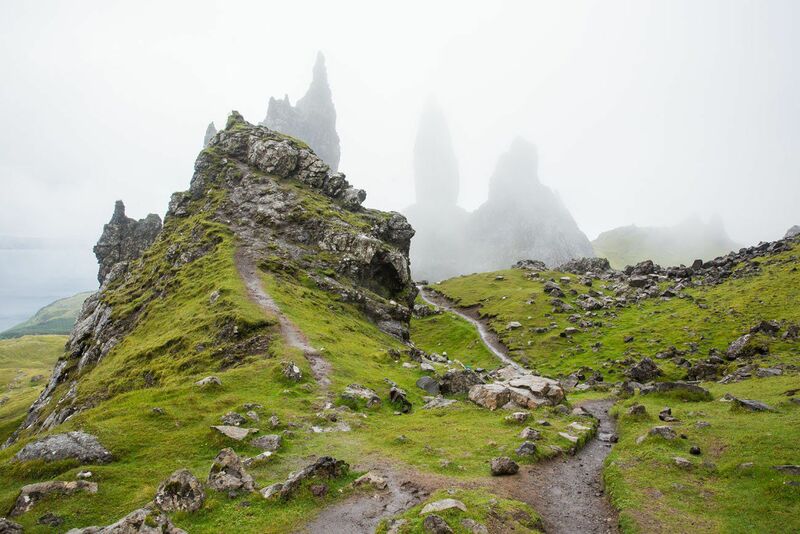 I’m planning on the Old Man of Storr, Fairy Glen (because of your post! 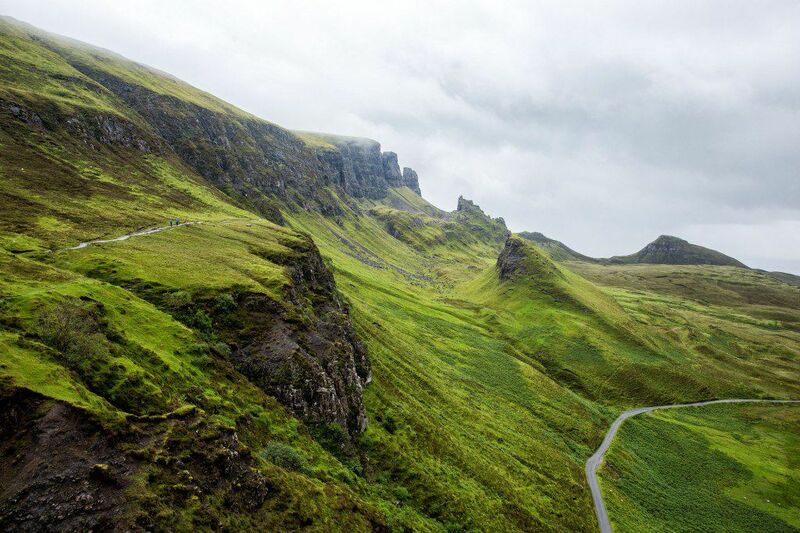 ), and the Quiraing when I’m on Skye. 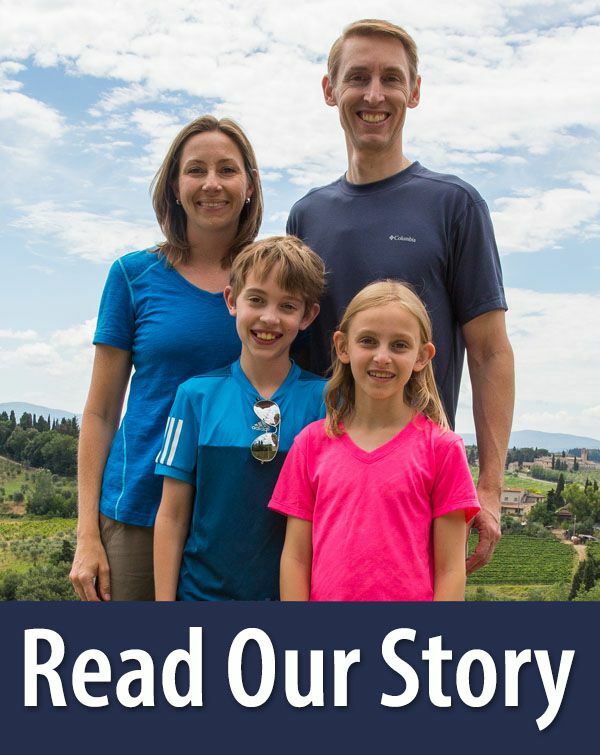 I have some questions about your sons use drone use; Were there many others using drones? 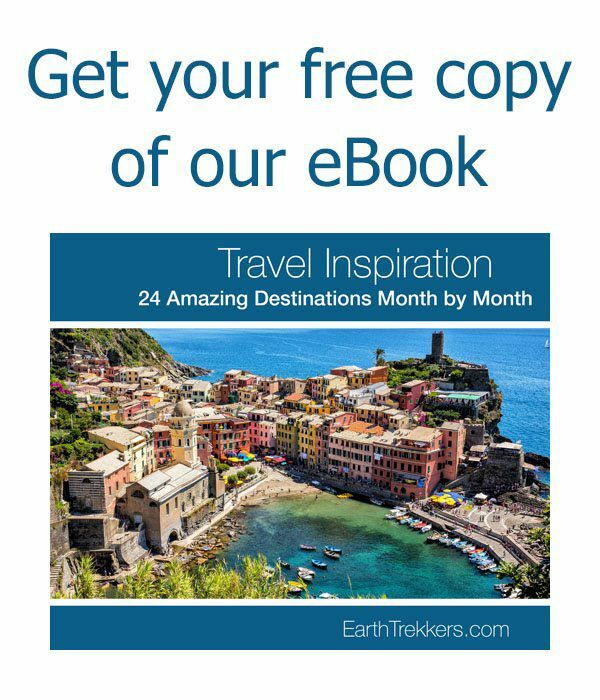 Did you get any negative feedback from other tourists/locals at the locations you visited about it being used? 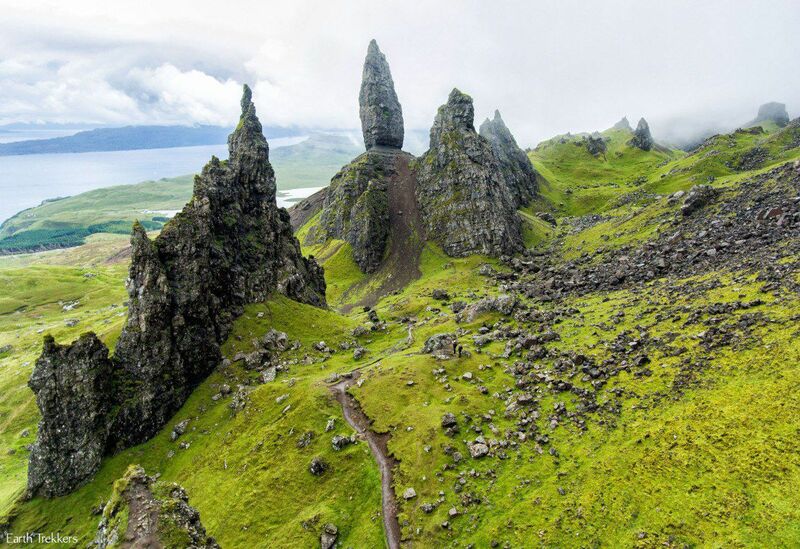 Drone is seems to be pretty well regulated over here in the U.S., such as not being allowed in National Parks, and while I know that there are only two in Scotland, I was curious about any limitations. 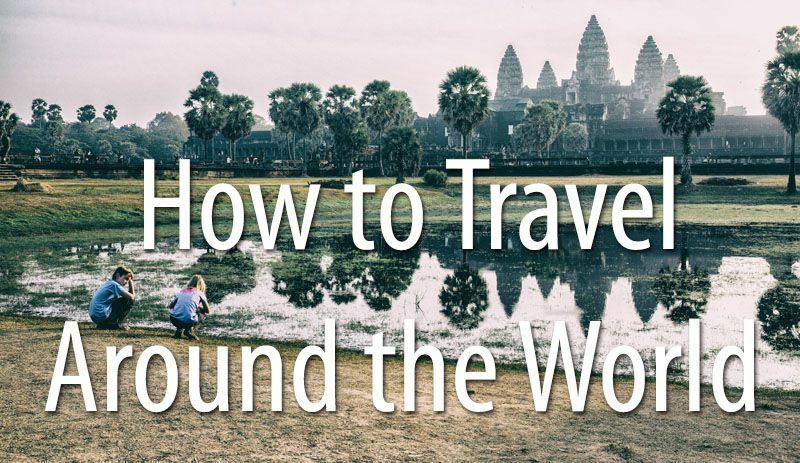 Otherwise thanks for another great post, and kudos to Tyler on his drone-work & video! I’m curious why people like to tell stories of when they broke the rule, in this case, jumping over a barbwire. I know that we bend and break the rules sometimes, but I don’t understand why people publish them. I’m really curious. Do you expect readers to do the same? I was there yesterday and there is now a stile over the fence, so it sounds like not only are you right but they have made it easier for people to carry on along the trail. 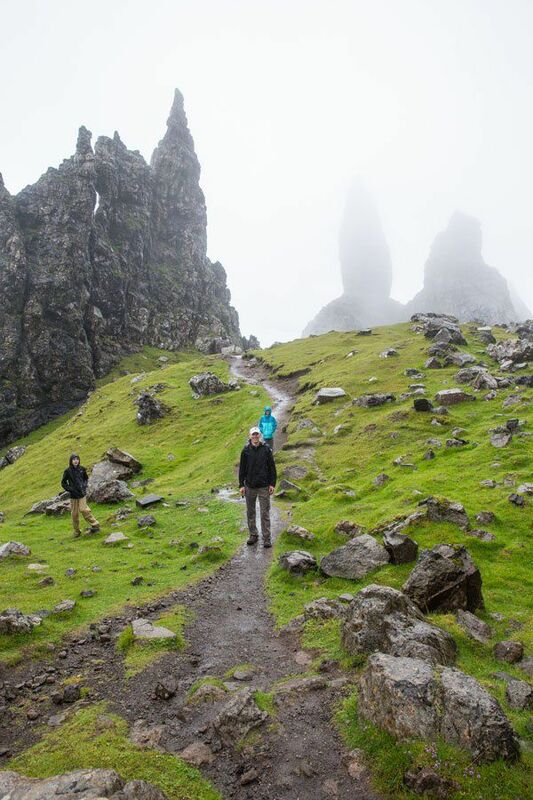 We are visiting Skye again this year and hoping to do some more hiking. 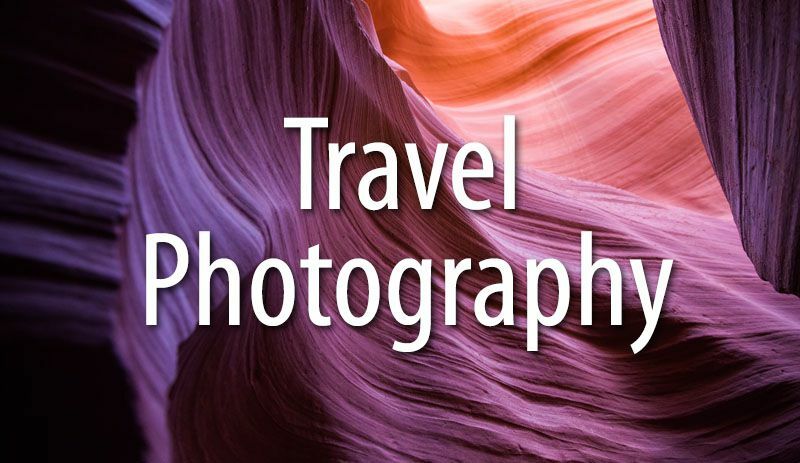 What kind of camera did you use to take these photographs? They are beautiful. I am nervous about taking my expensive camera in the rain. Did you worry about your camera getting wet? Thanks for being honest about the hike lengths, rain showers etc. Can’t wait!